Since Scully’s abduction with the first issue, the story arc has been leading up to our characters reaching Yellowstone Natural Park: half the issue is dedicated to this climax. We do not learn many things. Why exactly the Acolytes want William? All we got with seasons 8 & 9 mythology is that he is ‘important’ to the alien Colonists, and that ancient prophecies on the fate of mankind are linked to him. How that would roll out and what the Acolytes would do with him is not any clearer at the end of this issue. However, we do learn certain things. The Deacon is an Acolyte and they both share the exact same agenda, they only competed to be the first to reach their goal: who would be the one to become the “Usher“. As his name implies, the Deacon must be high in the Acolytes’ organization, which explains why he has certain powers — or rather his powers explain his position; it is still unclear how the Acolytes got these powers. The objective of the Acolytes was to bring (“Usher“) Scully, the “Bringer” (i.e. the one who brought William to the world) to Yellowstone, where she would have been sacrificed as an offering — the “Favor” — to the alien Colonists, who hold an underground craft there. 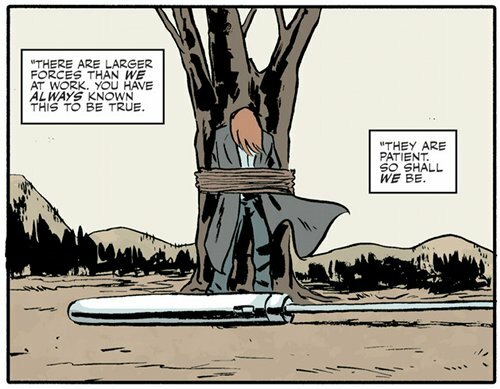 The Acolytes would have sacrificed Scully sooner (in issue #2) but the Deacon prevented them, wanting to do it himself later. 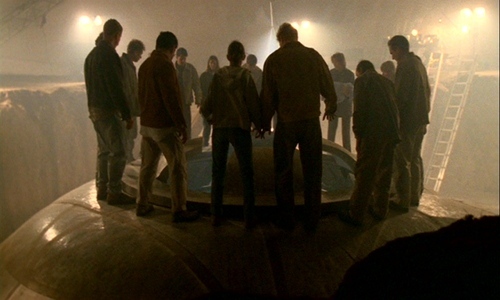 The Acolytes are a group of religious followers (“acolytes”) of the alien Colonists, an “alien cult” similar to that in 9X10: Provenance / 9X11: Providence only that they are hybrids — not humans, and, as they see the aliens as God, not fully aliens themselves. They have constructed a mystic aura around themselves and everything related to the aliens — their cloaks, the names for themselves, their vocabulary (“usher“, “light“, “darkness“), their sacrificial dagger — but beyond this religious devotion to the aliens, they might not hold answers themselves. They very well may be the “Believers” of the story’s title. 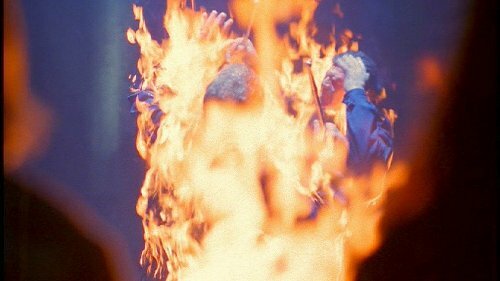 The alien craft emerges and burns them (like another UFO burnt the Faceless Rebels in 5X14: The Red and the Black); the Acolytes are in religious rapture, actually happy that they are taken by the ‘purifying light’ of the aliens. They are not considered equals by the Colonists, they are not even considered important. Perhaps they are a group of hybrids that was created years ago and that was left completely alone after the destruction of the Syndicate in 1999, after which the alien Colonists used other means than the classic hybrids to advance their plans. These hybrids instituted this religion to make sense of their existence. This still doesn’t explain some features of these hybrids, such as the glowing eyes, the flash of light and telekinesis, which we had not seen in hybrids before. Point of continuity: Scully uses the alien stiletto (which ssst‘s, not pfft‘s) to kill the Deacon by inserting it in the base of his neck, as we have seen happening elsewhere (e.g. 2X16: Colony). So long for the Deacon. The craft, purposefully it seems, spares Scully and Mulder. The overall story, ultimately, resembles a lot the storyline of 9X10: Provenance / 9X11: Providence, which featured an alien cult of humans that worshiped the aliens as God, who kidnapped William and unearthed an alien craft only to die burnt once the craft was activated (quite possibly by the presence of William), intentionally sparing only William. After all, we are left with few things that are actually new, apart from knowing that there are groups like the Acolytes out there now. In this issue and the previous, the Deacon talks several times about the diverse ecosystem that exists in Yellowstone as if this fact were important. The Acolytes talk of “the Cradle“: in the beginning, “The Cradle is bare“; then, “the Cradle, which they [the alien Colonists?] know is not empty“; then, after “the Favor is given“, “the Cradle is full“. As we know, the aliens or even single alien craft have the ability to give life (7X03: The Sixth Extinction), making them cradles of creation. The Acolytes might perceive this particular craft as their own “Cradle“. With the sacrifice of killing somebody, a life is given back to the cradle, filling it with life anew. The whole scene of the climax echoes of course the climax of Fight The Future with the large spacecraft in Antarctica, only that Mulder and Scully’s roles have been reversed here: the spacecraft slowly emerges from the ground and Scully is the only one witnessing it while Mulder is too hurt and tired to even look. Scully’s words are the same as Mulder’s in the movie: “Mulder, you need to see…” (versus “Scully, you gotta see this!“). The craft causes the chasing helicopters to crash — by the way we didn’t even learn who those helicopters were after all! The text synopsis for #5 says they are from the FBI, but this is not mentioned inside the issues — and then, fade to white. Scully no longer remembers what she saw: like in many instances before (4X18: Max, 5X14: The Red and the Black), alien technology erases memory. Scully: “It would seem their purpose was to show us something on some level beyond observations. Past the limits of normal memory and recall. […] I can recall flashing lights… colors… but the pattern is elusive and the memories behind them blocked.” Since Scully has no clear recollection, it could be that the craft did done a number of things to her that we do not know, either reading her mind in order to find out if she knew where William was, or perhaps inserting something in her memories or burying something in her unconscious, ‘programming’ her for a future event. 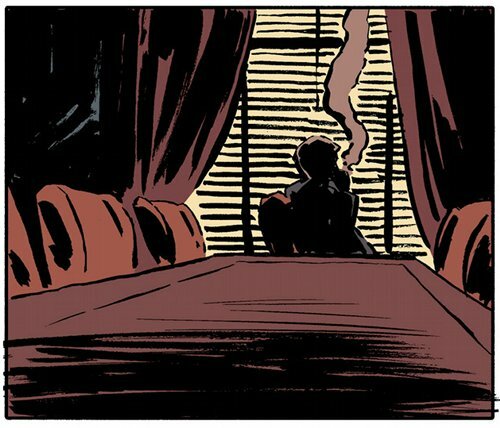 And in a mystery storytelling process typical of the X-Files, it is with this new unanswered question that the questions born from the previous four issues find their answer. The storyline of “Believers” can be summarized as such: The alien craft, trapped by a new magnetite pipeline organized by a new resistance, has to send the Acolytes it controls to fetch William and Scully, for a yet mysterious purpose. Of course it could be that it’s the other way around: The alien-worshiping Acolytes bring Scully to the craft on their own initiative, and the craft is activated due to Scully’s presence, her being the mother of William. What happened to the craft once it did that? Did the activation we saw allow it to overcome the magnetite barrier and fly away? Did the summoning of the Acolytes to bring Scully also result in the magnetite barrier to be breached? As the CSM says in the end, “We’ve lost Yellowstone“. That either means that the craft that was being contained has left the premises, or that Yellowstone has now fallen under the hands of the aliens and that the magnetite pipeline project has failed. The “CSM” reappears at the closure of this storyline — and we get further confirmation that there’s more than meets the eye with this apparent resurrection from #3. The scene happens in the very same apartment where we saw all the Syndicate meetings from seasons 3 to 6, at 46th Street, New York City. The “CSM” first muses in a way similar to what we have seen many times before, about the Yellowstone UFO, “it’s getting harder to find a good vacation spot unspoiled by tourists and commercial development” — this is reminding of discussions in the Syndicate about storing and safeguarding UFOs in 3X16: Apocrypha: “Leaks in security and a heightened public interest have made the base of Nevada unviable“. Below, from 2X03: Sleepless. Then we see he was speaking to an imaginary presence, before he breaks down into a crisis, his face dissolving, and like it happened in issue #3 he repeats exact sentences he has said before: “Treachery is the inevitable result of all affairs. Every man believes he has his own good reason.” is word for word from 6X11: Two Fathers. All this shows neither stability nor lucidity for this CSM character, whoever he is or however he got that information. 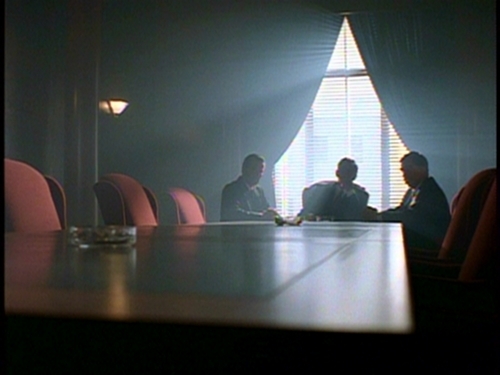 In a big final twist, he is then revealed to be essentially in the captivity of a Glasses-Wearing Man, let’s call him, hidden in shadows, who observes him and tries to pull information out of him: “We have all the time in the world.” This reversal of situation puts the CSM not in control of things, and once more there is more going on here than merely the unrealistic resurrection of a deceased bad guy. This Glasses-Wearing Man might be using the CSM, or at least this being that has his likeness, to his own ends, which might be resistance to the alien Colonists; he might have been the one to inform the Lone Gunmen that Mulder was coming, to send the CSM to give Mulder the alien stiletto, to finance the magnetite pipeline. Yet since this new figure is trying to learn something from the CSM, the CSM is not his invention. Clearly, there is plenty of future developments to this storyline. And so with William being confirmed missing and essentially becoming the new Samantha for Season 10, Scully and Mulder both find reason enough to join the FBI again. Scully: “I only know one way for me to help” [prevent colonization? protect civilians from the Acolytes?]. Whether joining the FBI is really the best strategy and the best use of Scully’s efforts is debatable — XF spent a great deal of its storylines around the corruption within the FBI and the fact that it was deeply compromised with the forces helping the alien colonization. Clearly, the return to the FBI is a way for Season 10 to return to the formula that is best known to the larger public: two FBI agents, investigating the paranormal on a weekly (well, monthly) basis — allowing for stand-alone stories. To be fair, even though the series finale went in great pains to separate Mulder & Scully from the FBI, it was thought at the time to give the writers greater flexibility in their future storylines, I Want To Believe brought the FBI back in focus. Season 10 just extends that. The scene with Scully testifying in front of the FBI’s Office of Professional Review (OPR) is exactly like in Fight The Future (yet another callback to the movie in this issue! ), even down to the head reviewer who for all we know could still be the same person, A.D. Cassidy. It’s Scully who is motivated and wants to find and protect William, the focus is much more on her than on Mulder — which is odd given that William is the son of both. Perhaps Mulder is as worried but not convinced that joining the FBI is the best way forward. Regardless, Scully is the driving force to find William here, paralleling the way Mulder was pushing both forward to find his sister Samantha. We have a really strong Scully in these last two issues, and Michael Walsh repeatedly presents her in a cool, epic fashion, Scully-foo-ing or rising out of destruction to protect her partner. And so Agents Scully and Mulder have a new objective: find William, and also find Doggett and Reyes and that third agent Reyes was with. Plus, they have a stiletto! Although that is their priority, along the way they will also investigate “Monster of the Month” cases just like they did during the series, when the priority was Samantha and the conspiracy/alien invasion storyline; the impatient fan might want the story to focus on the mytharc only, but what made the X-Files so good was this mixture of the surprising stand-alones and the mysterious underlying storyline, and Season 10 is no different. A different configuration could have been imagined, without putting them back at the FBI — and there have been myriads of fan fiction stories to support that! One possibility would have been M&S becoming private investigators (a bit like in the noir black & white cover for #1!). Another that they become advisors or external consultants to a new generation of investigators, at the FBI or elsewhere. Or that they pursue investigations as an off-work “hobby”, while working elsewhere simultaneously (Scully as a doctor of course, Mulder as…a journalist for the Lone Gunmen Revival?). The decision to put them at the FBI, what readers and potential readers associate them with, is certainly the most prudent and less risky one. There are more story threads to tackle: how and why Mulder & Scully were under the protection of the FBI, how the new training and reinstatement will happen, what will Mulder and Scully and Skinner’s new roles will be, what does the “new” FBI looks like, will Mulder & Scully answer to another Assistant/Deputy Director? All these will need to be expanded upon a bit more — which must be the reason why the next story, “Hosts“, although a “Monster of the Month”, is spread over two issues. All in all, with “Believers” Season 10 is off a good start, nowhere near resolving Season 9’s mythology, but at least things are progressing, and in interesting directions. The file is reopened, and we will be reading. This entry was posted on Friday, November 22nd, 2013 at 3:17 pm	and is filed under Comics. You can follow any responses to this entry through the RSS 2.0 feed. You can leave a response, or trackback from your own site. My guess is that the CSM is indeed the real deal. The picture of his last ‘seizure’ seemed to me as if he was about to dissolve back into ash – the very ash from which he was revived. This may have been done by Glasses Guy, or by somebody he is working with. I’m not exactly sure whether he or the Glasses Guy are opposing the Colonists, nor am I exactly sure how whoever used the magnetite to ‘imprison’ the UFO could have done so. Surely the Colonists would have had time enough to remove the craft after they learned that humanity has realized what magnetite can to them and/or their technology. I really hope we’ll eventually get some sort of flashback series depicting how the FBI/Mulder & Scully got rid of the Super Soldier threat. That has to be revealed eventually. I hope Glasses Man is Strughold. That would be a nice throw-back to FTF.